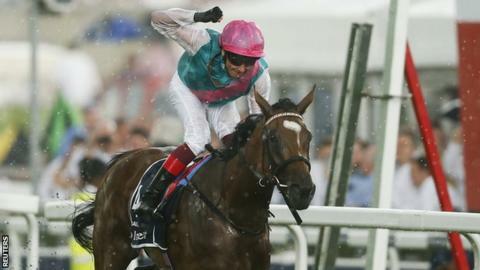 Jockey Frankie Dettori rode Enable to victory in the Oaks at Epsom on Friday. The 6-1 priced John Gosden-trained filly saw off favourite Rhododendron to win in the driving rain. Rhododendron finished second while her trainer Aidan O'Brien also saddled Alluringly in third. "In the back of my mind I thought we had a chance," said Dettori. "The rain spoiled it a bit as I was concentrating on my game plan so I didn't have much time to celebrate crossing the line." Thunder and lightning closed in before the race, with Daddys Lil Darling withdrawn after hurtling towards the starting stalls rider Olivier Peslier deciding to jump out of the saddle. A tremendous horse race in which the two main protagonists asserted inside the final half-mile before the winner came out on top in great style, and in a fast time. And it was a performance of extra quality because of conditions. Dettori seemed to only semi-joke when saying that the thunder and lightning scared him let alone the horses. Although both trainer and jockey said they wanted to concentrate on celebrating today's achievement now, this clearly puts them in a fabulous place for tomorrow when they have Cracksman in the Derby. After this, Cracksman is practically sure to be favourite.